We can assist you in every phase of buying or selling - from contract to closing. If you are relocating to the Bay Area or just moving across town we will not stop until we have found your perfect home. Sometimes purchasing a new home can add a lot of stress to your life, but we make this a happy and informative experience. We have a number of clients that are in search of a second home. Our office is located in N. Redington Beach right on the Gulf of Mexico. 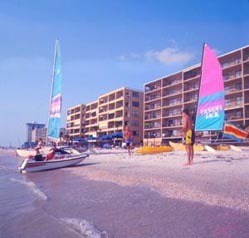 We know, very well, the condominiums from St. Petersburg Beach to Clearwater Beach. We can inform you of the rental programs and possibilities that condominium ownership can provide. If you are thinking of building your dream home, or purchasing a commercial property we can help. Our team will aid you in all the research it takes for these purchases. We believe a wise person may not know all the answers but knows where to find them. If you are a seller and have tried to sell your property yourself; you know of all the pit falls possible before you close; here are a few. Pricing your property in a competitive market. Qualifying Buyers. As a Buyer or Seller we will guide you through the finance process. We work with several local and national lenders who are familiar with our area and are professionals in their field. Inspection headaches. Home inspections can be intimidating, but we will be there for you every step of the way. We will also deal with appraisers and contractors. We have an in-depth plan that will also save you money. Let us do all the work while you reap the rewards. Referrals are a big part of our business. We would by happy to help your friends and relatives and we can assist you in other parts of the country, too.